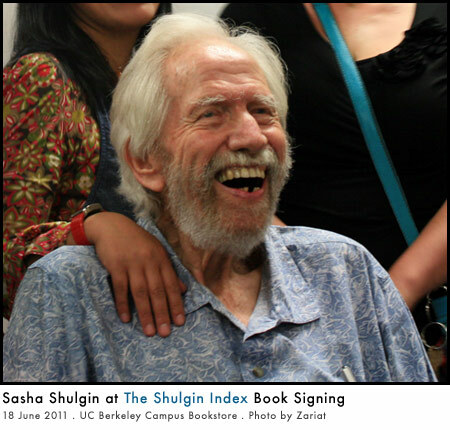 Last Saturday, June 18, friends and fans of Shulgin research turned up in surprising numbers to the UC Berkeley campus bookstore for a signing of The Shulgin Index, Vol. I. 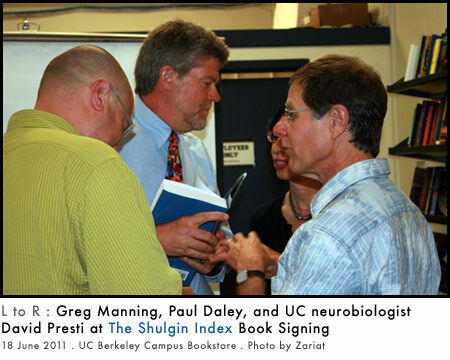 University of California neurobiologist David Presti introduced the authors, Sasha Shulgin, Tania Manning, and Paul Daley. After a reading from the book and a brief Q&A session, the authors greeted guests and personalized copies of their latest work. The audience was peppered with notable researchers amongst the supporters. Chilean psychologist Claudio Naranjo, a pioneer in the use of MDMA and other psychedelics in therapeutic work (and longtime friend of the Shulgins), was introduced. He was received with warm applause. Transform Press reported a record number of one-day sales at the event. Proceeds from books purchased will directly support further Shulgin research and publications. 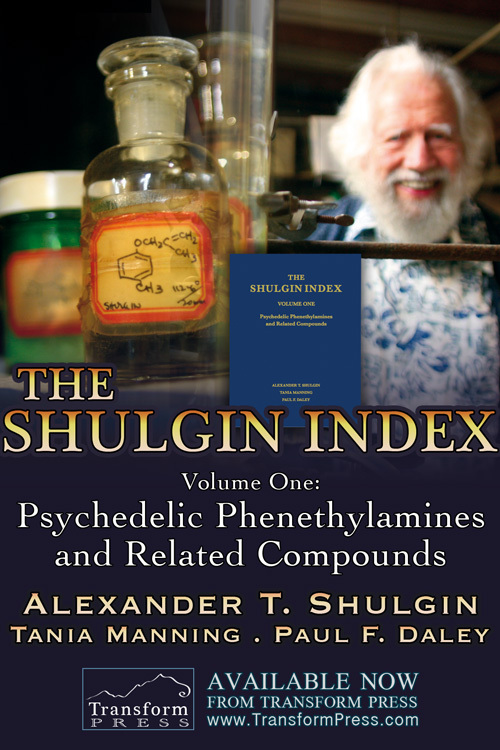 First edition, first printing, hardcover copies of The Shulgin Index and other Transform Press titles will be available for purchase. Sproul Plaza, UC Berkeley Campus, 108 Martin Luther King Jr. Please join us… and help spread the word – invite your friends! 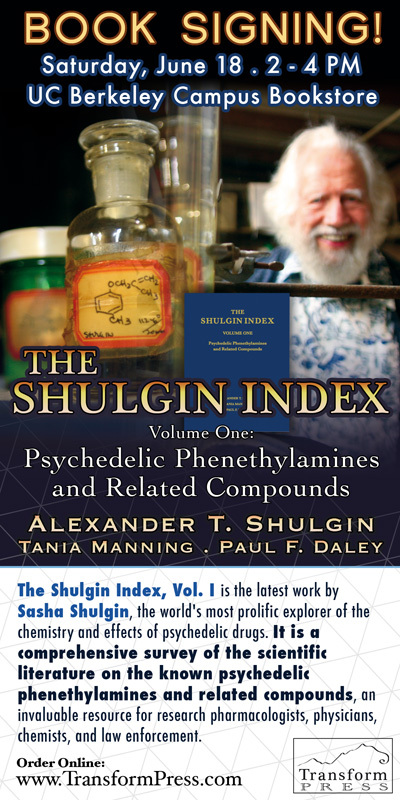 The Shulgin Index – Volume One: Psychedelic Phenethylamines and Related Compounds is the latest work by Sasha Shulgin, the world’s most prolific explorer of the chemistry and effects of psychedelic drugs. It is a comprehensive survey of the scientific literature on the known psychedelic phenethylamines and related compounds, an invaluable resource for research pharmacologists, physicians, chemists, and law enforcement. • A structure-oriented survey of psychedelic phenethylamines, amphetamines, phenylpiperazines, and other similar compounds. Structure-activity relationships are emphasized throughout. • Treatment of 126 main compounds with detailed physical properties, syntheses and analytical chemistry, biochemistry, pharmacological properties, and legal status. Fully referenced with over 2,000 citations. • Sub-tables of lesser-studied structural homologues and analogues. Over 1400 total compounds covered. • Extensive cross-referencing tables for rapid location of key information. Sasha’ mental state seems to have improved during the day, since he came home from hospital, but the “sundowning” is almost always present, to some extent, by the time evening comes. His chemical knowledge is still there, though, and now that he can work in the lab with Paul, it will probably sharpen and improve, along with his analytical ability and other aspects of his mental functioning. But he can’t be left alone, because there’s too much risk of falling, among other things. So we continue to fund-raise, because we’ll need 24-hour a day help for the rest of Sasha’s life. So far, as I’ve said many times, we’ve been amazingly lucky in our caregivers, with perhaps a single exception, but we’re busy taking care of that exception. We seem to have attracted really lovely human beings — funny and caring and patient — and may it continue to be so. With Tania and Greg as our right and left arms, all we can do is give thanks (and feed them all Basmati rice).